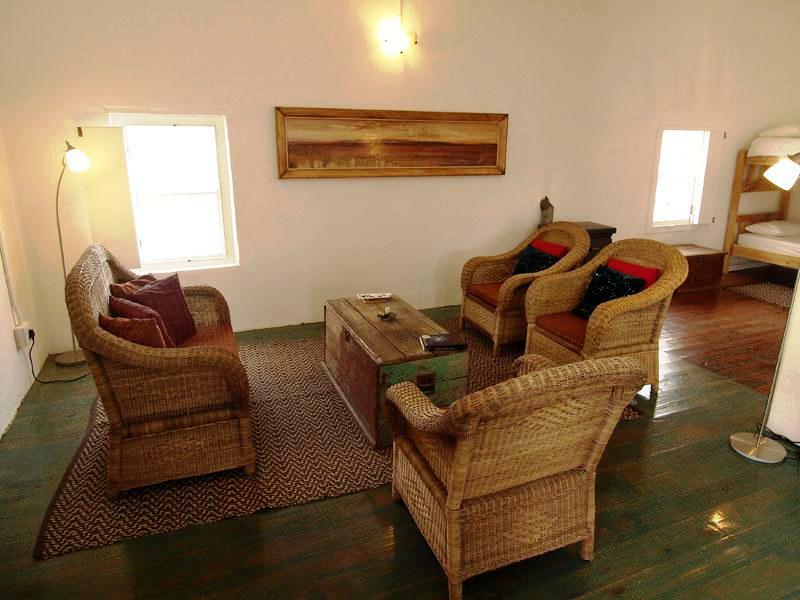 This bright, comfortable old Karoo house is stylishly furnished and well equipped for self catering. The house was originally a sculpture studio and is decorated with original artworks. Some of Clive&apos;s original works also remain in the zen-inspired, walled garden. The working windmill feeds an old cement reservoir, perfect for a refreshing dip on hot summer afternoons.<br /><br />Lying in the heart of Nieu Bethesda, Aandster comprises three bedrooms, of which one is in the garden. There is a shared bathroom, a spacious open-plan lounge, dining and kitchen area and a private garden with a braai and a swing for the kids. <br /><br />Depending on the season, you can light a fire in the woodburner in the lounge or sunbathe in the walled garden. Crisp cotton linen keeps you cool in summer and woollen duvets and mohair blankets warm you in winter. Pets are most welcome by prior arrangement.<br /><br />Life in Nieu Bethesda potters along much as it did 130 years ago, when the village was founded. Stone water furrows still line the wide, dusty streets. Night skycaps are unpolluted by streetlights, and the air is still fresh and clean.<br /><br />Nieu Bethesda has a working network of furrows, with water supplied daily from a spring on the plateau above the village. Residents channel water into their gardens using smaller gated funnels. Visitors can hike along the furrows up to the spring. Horse riding is offered at several places in the village as well.<br /><br />The area around Nieu Bethesda is ideal for mountain bikers of any calibre, with two mountain bike trails in the area. Alternatively, hire a motorbike from the Outsiders Bed and Breakfast and cruise around the village. "Aandtster....A lovely place to visit"
"Beautifully clean and comfortable...within walking distance to The Owl house and Karoo Lamb....such a quaint little village..."
"Spacious, neat and equipped with everything you could need"
"Aandster is a lovely cottage in the heart of Nieu-Bethesda where you can escape the city lights, trading them for starry skies." "Found the accommodation very comfortable and well supplied to make our visit a memorable one.Many thanksBarry Sylvia &amp; Joe"
"We had a lovely stay at Aandster. Clean fresh bedding. The garden need serious attention but for us that just needed a bed it was good enough." "It is the best pet friendly accommodation we ever stayed in! Service is excellent! Very friendly staff! This will be our yearly overnight stay to Kleinmond." "Just what you need, would be great for families with children.Fireplace was the highlight."